It's official. We love Paris. But it took us a while and a few visits to get there, and we did have a rocky relationship with Paris: on one hand, it is clearly one of the most beautiful cities anywhere. On the other hand, we always had some kind of experience in Paris that made us less appreciative of its beauty. Like getting our iPhone grabbed from your hand on the street, followed by a running chase, followed by a police chase, for instance. (The police chase was actually kinda cool.) But we have kept coming back and always gave the city of lights another chance. Coming from Prague, the sheer size of Paris can get overwhelming: a single week is not enough to even begin to understand how big the city is and how different the districts are. Throughout our visits, we have noticed a shift. At the beginning, we saw parallels between Paris and Vienna: the Belle Epoque charm, the monumental palaces and so on. During our later visits, and as we gravitated towards Marais as our district of choice, we have started to see similarities to Berlin: bright New Balance sneakers, fixie bikes, baristas that look like ZZ Top roadies and Australian university drop-outs. Yes, Paris has turned hipster. And we kinda like that. EMA Espresso Bar Opened in June, the newest entry on the Prague coffee scene has quickly become very popular. The modern interiors referencing Czech functionalist architecture are full of light and create a nice atmosphere; the staff is nice and knowledgeable and uses their La Marzocco Strada EUR 20,000 machine to prepare cup after cup of delicious coffee. You can always get espresso or drip coffee either from the coffee roasters of their current preference - JB, based in Bavaria, or their "coffee of the week", which includes anything from Square Mile, Bonanza Coffee Roasters, Doubleshot, Union etc. In addition to coffee, EMA offers a few easy and quick fixes: sandwiches, focaccias, two salads, and a small selection of cakes. They do plan to put more focus on food in the future with the addition of a chef, but you should not expect a restaurant. EMA will always remain an espresso bar at heart. One think should be noted: as a true espresso bar, EMA does not offer wifi to its guests. And for those who don't like coffee, EMA offers a small selection of great teas by TeaJay and home-made lemonades. A long-established Karlin district's staple, Muj salek kavy is loved equally by locals, expats and travelers, and can get quite easily crowded, especially when they close down their outside seating for the winter. The cafe is owned by Doubleshot, arguably the best known independent Czech coffee roasters, and the owners make great use of their own roasts, using their custom-made Spirit Duette coffee machine. Breakfast is served from Monday to Friday until 11am and the whole day over the weekend, and a light lunch or dinner can be had afterwards, including a daily soup. The food is good, but let's face it: the coffee is the star in this establishment. We hardly ever get a cup of coffee without some of their delicious cakes. Our favorites include their cheese cake, carrot cake and banana-and-coffee cake. They are on the sweet side, but we like them. The staff speaks fluent English (one of their baristas is a Melbourne native) and is very welcoming. This definitely IS your daddy's café. While other establishments may unapologetically form a part of the recent hipster café trend, this café and restaurant clearly evoke times long past, the times of Belle Epoque and the First Republic. The café may feel a bit cramped on first sight, but it is very cosy and fills up very quickly. They serve espresso-based drinks, vacuum pots, drips and cascara drinks. This is the only café on the list that features a proper kitchen and doubles as a full-fledged restaurant, and the food is not bad. About the desserts: the Czech baked sweets on the table are nice, but definitely skip the desserts in the glass vitrine. If you want some elaborate cakes, visit the nearby Cafe Savoy instead (but skip the coffee there). In addition to coffee, Café Lounge serves local wines with a focus on organic wines made in Central Europe. The café also rents out picnic baskets in the summer. Owned by the former co-owner of the Leeda fashion label, I Need Coffee sells nice coffee; cakes and macaroons made by Chez Lucie, a famous Czech food blogger (and our friend); some sandwiches; kremrole (Czech merengue-filled rolls); Czech ciders; croissants with jams from Hradec Kralove etc. They also serve breakfasts, mostly of the meatless kind. All served in beautifully designed cups and tableware. The one-room café is beautifully designed in a minimalist fashion. In addition to coffee (and this is the only café on the list that does not offer drips) and food, you can buy some cool books about design, designer towels and glassware, and sometimes a themed T-shirt. I Need Coffee is a great place to stop on your way to or from the Vysehrad Castle. The owner of this small café near the Charles Bridge is a photographer (and some of his equipment is on display in the café) who used to work at Café Lounge. TriCafé serves good coffee, nice home-made cakes and nice savory treats. To call the design of this café minimalist would be an understatement: the café features just the bare essentials: the bar, a few tables and chairs. That's it. However, the atmosphere is very relaxed and nice (even though the Charles Bridge is just few steps away), and you can see they all put all their heart into their little cafe. If you need a dose of caffeine and you're near the I.P. Pavlova subway stop at the border of the New Town and the Vinohrady district, the Prazirna is the place to go. As the Czech name of the place suggests, the café roasts its own beans. The place is located in a cellar and is popular among locals, especially in the evening. If you need wifi, sit in the first room, while the second room will provide more privacy. While we are not blown away by their selection of small nibbles (clearly there's space for improvement when it comes to food), they do understand their coffee and they always welcome you with a smile. One of the first gourmet coffee establishments in Prague, this mom-and-pop operation has been on the coffee map for years. The owner reigns supreme in this café (e.g. refusing to serve sugar with the coffee), and a visit to this café is more like a visit to the owner's living room: it's small, and it's personal. That said, the place has a loyal following, and offers some nice small dishes, cakes and pastries made by the owner's wife (who, incidentally, comes from the same small town in Eastern Slovakia as Jan's mom). Mezi zrnky in the Vinohrady district is a diminutive café replacing the now extinct Cup Up café. Their barista Jara is a coffee geek full of ideas: recently, the café organized a coffee pairing with food. This café can serve also as a bistro: the establishment offers a daily soup and some other small dishes. It is small, with the seating capacity of no more than ten, but it's quite cosy. We love their tables decorated with newspaper shreds. The most common complaint we get from our coffee-loving Australian guests is that they went on for weeks without a nice cup of flat white. What is "flat white"? Well, it's basically a cappuccino with a double shot of coffee, usually served in a short glass. We think it might be called a "latte" in Australia but here "latte" means a coffee drink with a single shot of coffee, milk and milk foam. To be honest, Jan had a flat white a few weeks ago for the first time, having heard about it so much on the tours, and is a complete convert. There is no going back. As far as truly ‘local’ activities go, relaxing with a book or a laptop and slowly sipping coffee in a café surely ranks near the top. Yet very few travelers allow themselves the luxury of spending time doing next to nothing in a café. There are simply too many other things to do and see. 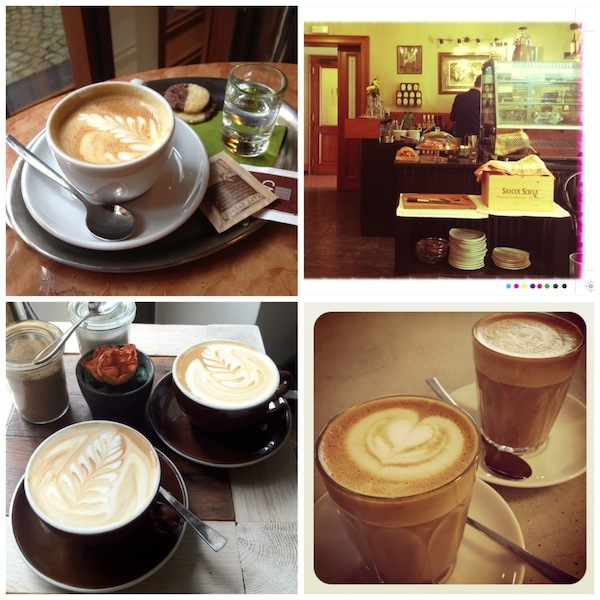 Therefore, kicking back in local cafés becomes something of a guilty pleasure for many. As much as I love to see people checking one sight after another in Prague, I have to confess that it also makes me a bit sad because relaxing in a café provides some unique insights into the local culture and should be something you do in between sights. Luckily, there is a strong coffeehouse culture in Prague, and the city’s historic cafés have long been included among the must-sees. Almost every guidebook features top traditional coffeehouses, and if you google ‘Prague's Best Cafés’, you will get a lot of advice on the ‘best’ cafés. However, this also means that cafés that once oozed with local atmosphere now hardly have anything to offer beyond their history and their polished wooden floors, big picture windows, and unique interiors. And because these places are crammed with guidebook-carrying tourists, the waiter tends not to care if you are coming back. Ordering a cup of coffee in these establishments can be a huge mistake and the locals have moved on, and so did the atmosphere that made the cafés so appealing in the first place. The Cafe Slavia, the atmospheric The Cafe Louvre and the only Cubist-style coffeehouse in the world, Grand Cafe Orient, are three examples of cafés destroyed by tourism. Established in 1863, Cafe Slavia became a meeting place for artists and intellectuals – it’s regular patrons once included Franz Kafka, Rainer Maria Rilke, Jaroslav Seifert and the composers Smetana and Antonin Dvorak. Today, it is packed with tourists hunting for pictures of beautiful Art Deco architecture and the astonishing views of Prague Castle. Cafe Louvre is another café of this kind. The Parisian-style café with a billiard hall is part of the First Republic's heritage, and its famous patrons included Albert Einstein, Karel Čapek and Franz Kafka. However, the combination of crowds of tourists, coffee of poor quality and disinterested waiters makes me pass this establishment by without any regret. The Grant Café Orient is another remnant of the past. However, for a rare chance to see cubist architecture up close, I recommend that you enter the fabulous geometric balustrade and climb the teardrop-shaped stairwell to the Grand Café just to see the really beautiful interior with many interesting details and a narrow terrace. Do not order anything, just look. Two traditional cafés that we still like (although we would not order coffee there) are Café Imperial and Café Savoy. The former is an Art Deco gem with ornate mosaic and tile-covered interior. Ask for some Czech classics such as Braised Veal Cheeks or Marjoram Braised Lamb Shank and observe the steady stream of local businessmen and ladies, all wearing smart suits, having their lunch. The latter is a charming little spot to for a rich breakfast before a stroll around the Petrin Hill. So, what are the atmospheric local coffee shops I want you to discover and spend some downtime in? My first-choice café is Al Cafetero. This small, non-smoking, family run café is true coffee lover’s paradise. The owner will be your most accommodating host, offering samples, souvenirs and a friendly chat. Try the delicious, awesome-tasting coffee made from a vacuum pot, but be prepared to be offered neither milk nor sugar with your coffee. Můj šálek kávy ("That's my cup of tea") - This place is what a coffee shop should be: great coffee, good atmosphere, nice staff, convenient hours and it a really ‘local’ vibe. The baristas turn out some of the city's best espressos and drip coffee. You can stop by for breakfast in the morning, for a tasty lunch in the afternoon, or just sit down with your book/newspaper/laptop after dinner and catch up on your reading. Café Lounge - This Malá Strana spot combines elegant interior (formerly a residential apartment) with nice food, friendly service and good-quality coffee. You can easily spend hours here reading, talking or just looking around and sipping some gorgeous Moravian wines. Besides, it is a non-smoking café with a lovely garden. Dům kávy is a perfect place to purchase premium coffee beans, coffee makers, grinders, espresso machines, etc. Although more a shop than a café, Dům kávy serves one of the best cappuccinos in town. What I like about these five cafés is that despite their appealing atmosphere, locals still far outnumber tourists, the coffee is great, the staff is friendly and reliable, and the cafés are still what they should be – places to linger over coffee rather than take photos. And I hope that doesn’t change.